New Riders of the Purple Sage is a strong debut, notable not only for the involvement of the legendary Jerry Garcia as pedal steel guitarist, but also for the great singing from John Dawson, the strong harmonies, David Nelson’s pickin’, and, perhaps most importantly, the catchy strong writing — there isn’t a weak song in the bunch. Solidly in the county rock vein, this album is a whole different animal from Garcia’s work as a guitarist with the Grateful Dead or as a banjo player with Old and in the Way, so direct comparisons are difficult. 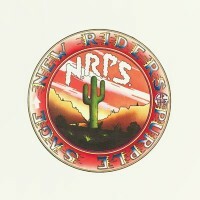 Sure, the Dead played plenty of country material on American Beauty and Workingman’s Dead, but this does not sound like either of those albums, nor does it evoke the Byrds’ brand of country rock; it’s more akin to the Stones’ “Dead Flowers” (with which, appropriately enough, the current lineup of NRPS has opened many shows since their debut in 2006). I have heard their style called cosmic country, which would seem to fit in reference to the “far out” pedal steel style of both of the band’s prominent pedal steel guitarists, so it seems as good of a label as any. Those who enjoy the mournful qualities of Jerry Garcia’s voice probably will enjoy John “Marmaduke” Dawson’s lead vocals here, and a listener’s reaction to the lead-off track, “I Don’t Know You”, will probably serve as a pretty good indicator as to whether or not they will like the rest of the album. “I Don’t Know You” features some fun interaction between Garcia and Nelson, and any fears that these tunes will be stretched beyond the boundaries of good taste are allayed by its radio-friendly brevity of two-and-a-half minutes. Those of us who happen to enjoy the Grateful Dead’s explorations only get one song substantially longer than five minutes on the entire album, so, again, although listeners may find some vocal, tonal, and instrumental common ground, this album does not sound like anything that the Grateful Dead have ever done. The one song where they do stretch out is the laid back “Dirty Business”, and we get to hear some raunchy pedal steel from Garcia there, just enough to satisfy my appetite for it. Other tunes, in particular “Henry”, “Louisiana Lady”, and “Glendale Train”, are such tight, fun singalongs that stretching them out with long jams would have seemed superfluous in this studio setting. Want to hear more raunchy pedal steel? Listen to their album ‘Gypsy Cowboy’ By then, Buddy Cage had joined the group as pedal steel guitarist and does a great job on the track, Death and Destruction!